I created Noel Romantique en dentelle (french for Romantic Christmas lace) to be embroidered on sheer and ordinary fabrics. A little matching lace can really make a project unique and special. The lace has been digitised to be successfully stitched on tulle, English cotton netting and organza as well as ordinary light fabrics. May I emphasize that this is not Free standing lace. When the embroidery lace is stitched on sheer fabrics there are less stitches and so it makes a softer lace. There are many varieties of lace all around the world and some like Nottingham lace uses tulle as a base for a light floaty look which I prefer! Stitched on organza and trimmed after wards. 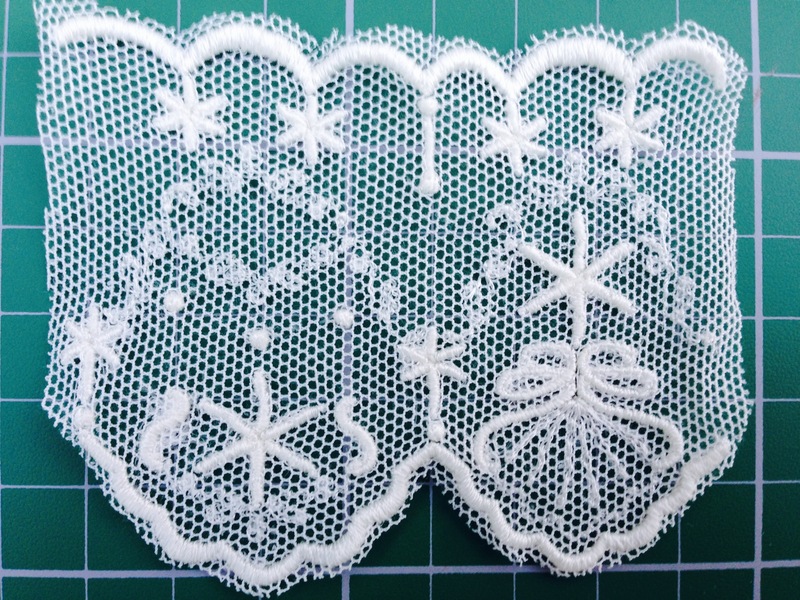 When I tested this lace I succesfully used Organza and also English cotton netting (see below) with Floriani Wet and Gone fusible stabliser which is washed away after the embroidery is complete. 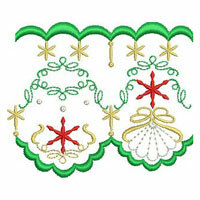 In the first set you have several versions of this lace which features a Christmas tree, little stars and snowflakes. Your choice of colours used will determine whether it appears to be Christmas lace or ordinary lace. 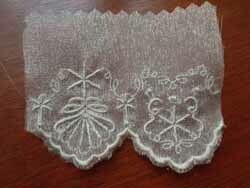 When it is stitched out in ivory or creams it does not stand out as a seasonal lace. The future sets in this collection will contain longer lengths of lace but if you have embroidery software you are welcome to edit these 4″ by 4″ designs to make larger ones for your own hoops. There are several very important things to consider when stitching out these designs. each time you change a colour remove the hoop from the machine and trim your jump stitches so as not to get a build up of jump stitches. Don’t forget to trim the back too but be careful not to trim too close to the embroidery to prevent the threads unravelling. remove one of the colours for a more simple lace. combine all the colours and stitch out in ecru for a really vintage look. You may wonder why I have not suggested that you trim the embroidery and create the scallops before it finishes. There are stitches within the designs to do this on ordinary fabric but when using sheer fabrics I think it is much better to trim the fabric after you have removed the fabric from the hoop. 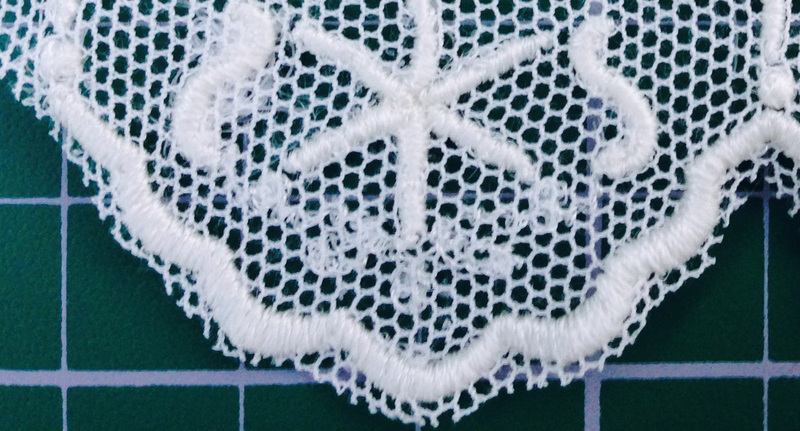 If you look at real vintage lace there are often lace edges protruding from the scallops which adds to the beauty of the lace which is never really perfect and so has a characteristic all of its own. When trimming you should be very careful and start by leaving small ends and checking to see how it looks from the front. 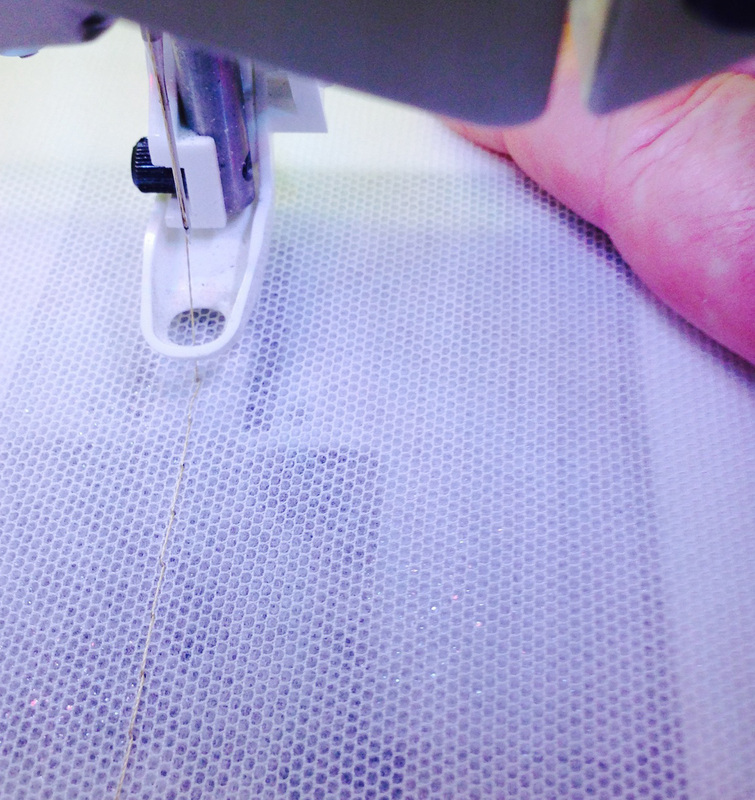 Step 1 – Prepare your embroidery design. When you purchase this set you will find two folders in your zip along with the all important PDF containing details on each of the designs. One of the folders will be labelled OAS and all the designs here have the option of Outline alignment stitches. These will be of great value in positioning your designs correctly as they stitch out the shape of the design. Select and open your choice of design in your embroidery software or on your machine and copy and paste if necessary to create longer designs. Make a decision whether you will stitch these designs out in one colour or in all the selected colours. You may want to combine some colours or remove some for more open lace. Finally do any colour sorting which is required. Step 2 – Carefully hoop your fabric and stabiliser. I like the results I get with Floriani Wet and Gone fusible stabiliser or a suitable stabiliser for free standing lace. Fuse the sheer fabric to the stabiliser if it is fusible. You can however lay the fabric on top of the stabiliser and gently hoop the layers. Check your fabric is laying flat, especially in the corners where bubbles can occur. Remember to check the back of your hoop too! Before I began my design I basted around the design with the feature on my machine smoothing the fabric if necessary. (I have prepared designs with OAS, an outline if your machine cannot do this) As the basting is done make sure the fabric is absolutely flat. Step 3 – Prepare your machine. Turn off the trim facility on your machine if it has been selected. I believe you will get a better finish if you do not use this facility but it depends on your machine and your preference. If your lace is going to be visible on the back a better look will be achieved if you use the same embroidery thread in your bobbin as well. I also slowed my machine down for the embroidery. 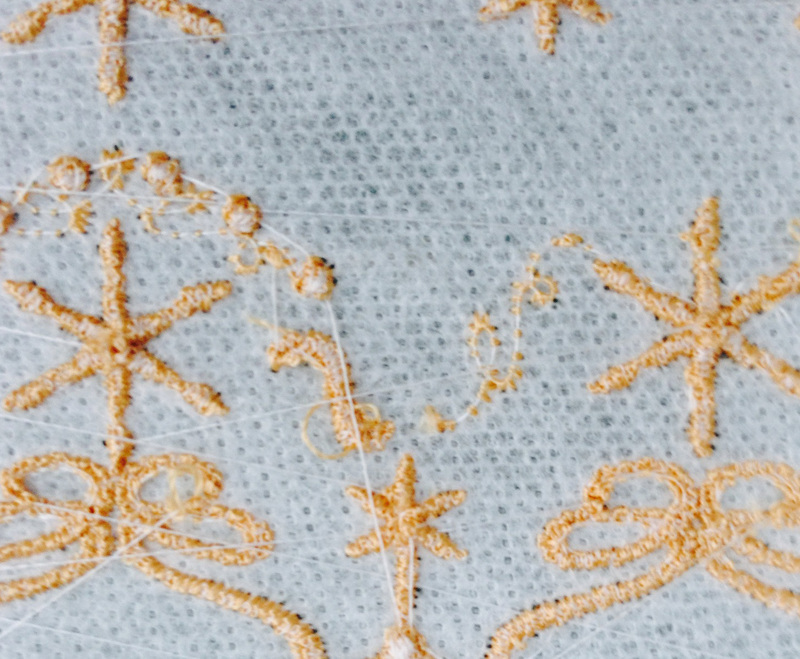 Step 4 – Stitch out your embroidery. Each time your machine stops for a colour change I suggest that you remove the hoop and trim all the jump stitches on the top AND underneath. Obviously you should not unhoop the fabric at this point. The trimming on the underneath must be done very carefully to prevent unravelling, so do not cut too close. Mistakes can be dabbed with some Fray check if necessary! 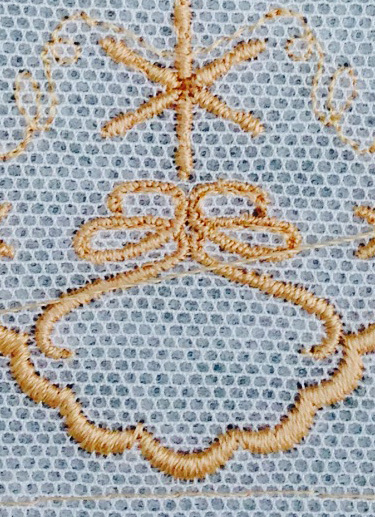 Step 5 – Finish off your embroidery. When each of your colours have been stitched out remove the hoop from your machine and take the embroidery out of your hoop. Carefully do all your final trimming. Before you soak your lace to remove the stabiliser cut away the excess. I hold mine under the tap before I soak it for a while in warm water. The longer it is left to soak the softer your lace will be. Many recommend a final soaking with some fabric conditioner added! Let your lace dry naturally on a towel. Press your lace on the back before using it to create the prettiest and most unique of projects. Don’t forget to look at the other designs at Graceful Embroidery that can be used to create your own distinctive lace. Cutting just a little off the edge for a realistic effect. The first set in this collection will be released in January 2014. Pre order it today by joining my Embroidery group. Almost finished! Just a few trims to make before rinsing out the stabiliser.